Danfoss has launched the DM430E display series. The CAN interface runs the Plus+1 functional safety protocol developed by the Danish supplier. 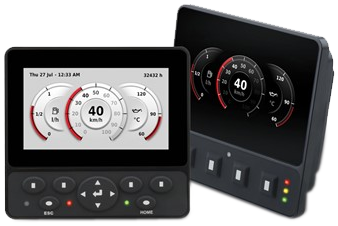 Danfoss Power Solutions has expanded its Plus+1 family of mobile machine products with the DM430E display series. “We’re excited to provide a modern display solution specifically designed for a rugged, off-highway environment,” said Darren Magner from Danfoss Power Solutions. “With unparalleled screen viewability in a compact design, the DM430E addresses both OEM (original equipment manufacturer) and end-user needs at a cost-effective price point.” The products feature a temperature range from -30 °C to +70 °C. The optical-bonded and anti-glare coated 4,3-inch color display is optimized for usage in all lighting conditions. In darker settings, the light sensor automatically adjusts screen brightness and switches between day and night display themes. Through the updated Engine Information Center (EIC) application, OEMs can directly set up the display without any programming. The application connects more than 4000 J1939-compliant engine signals with a set of pre-defined screen graphics, saving development time and resources. OEMs have the option of a four-button or navigation-button keypad, providing flexibility to optimize to machine requirements. The display can be oriented in portrait or landscape, direct RAM-mounting capabilities, and the opportunity to add USB and EIA 232 connectivity features. The CAN-based Plus-1 functional safety protocol has some similarities with the J1939/76 safety protocol. It was developed by Danfoss and is used in many of the company’s products. With the ability to add up to five extra inputs and one output, the display gives more flexibility and leaner wiring set-up, saving system cost with no extra I/O module needed. According to the supplier, the HMI (human machine interface) is suitable for material handling, road building, construction, agriculture, turf care, and other off-highway vehicles.